Winnipeg, Feb. 10, 2019 – The Manitoba Moose Hockey Club announced today the team has signed defenceman Logan Roe to a professional tryout. Roe, 27, has 23 points (3G, 20A) and a plus-37 rating in 48 games with the ECHL’s Florida Everblades this season. In four professional seasons, Roe has 80 points (15G, 65A) in 227 ECHL games, all with Florida, and appeared in three games with the Springfield Falcons in 2015-16. 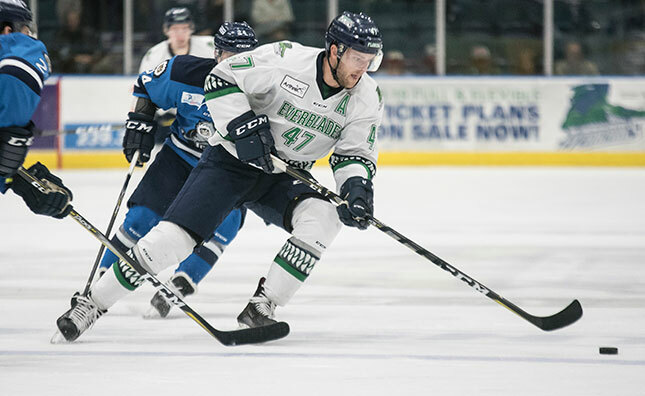 The Fort Myers, Fla. native led the ECHL with a plus-43 rating last season, and reached the Kelly Cup Final with the Everblades, recording three assists in 21 playoff games. The Moose continue a six-game homestand against the Texas Stars at 2 p.m. today at Bell MTS Place. Tickets for today’s Polar Bear Jersey Day are available at moosehockey.com/tickets.